To get it out of the way: I like this movie a whooooooole lot. It's fun, in addition to being rich, thorough, elaborate, and engaging. I don't usually associate "fun" with wartime drug trafficking and squishy gore (there are several not-for-the-squeamish moments), but that's what Dibakar Banerjee is so consistently able to do. The story and its attendant details and visuals fold back in on themselves; things that seem throwaway as they happen pop back up later as context or stage-setting. This film strikes the balance that must be so hard for mysteries: there has to be suspense, but there also have to be clues and answers among what the author introduces, because solutions that come out of nowhere are frustrating. The world of Detective Byomkesh Bakshy! is big enough to let the questions jangle around but not so big they peter out. Divya Menon as Satyawati, a relative of some of the people uncovered in the investigation (and eventually Byomkesh's almost unspoken love interest), doesn't get as much to do but portrays an important blend of competence and fear, maybe serving as the audience stand-in even though she's not his Dr. Watson, behaving completely appropriately for a normal, essentially face-value person who's shocked to find herself in a criminal world but also manages to keep some of her wits about her. I think she's the only major character who doesn't overtly lie to anyone, making her...the standard-bearer of morals, yet in a different way than the "woman is the izzat of the house" that disgusts me so much in some Hindi films. She's not a vessel or a canvas; she has brains and agency and demonstrates integrity. 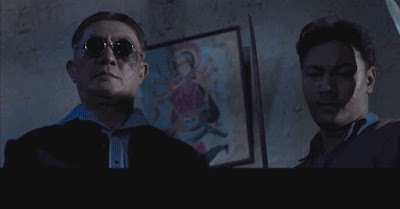 * There are fun performances from some side characters too; in addition to believably playing small but key roles in the mystery, Meiyang Chang**, Arindol Bagchi, and Pradipto Kumar Chakraborty (I think? I'm blanking on the name of the quiet but funny servant) color the central boarding house so well that I wanted more of their characters even though that wouldn't have been strictly necessary to the story. A related facet of this movie left me not only less than satisfied but actually grumpy. [Spoilers for the next two paragraphs!] The scene in which Byomkesh has very Poirot-esquely gathered the key players together to reveal whodunit needs a rewrite. Several people bumble in ways with literally lethal consequences even though 1) they have demonstrated that they are smarter than that in the rest of the film and 2) there must surely be ways for writers as talented as Dibakar Banerjee and Urmi Juvekar to get the effects they want/need for the conclusion of the story without having people be so idiotic. Why is no one pointing a gun at Yang Guang? Why do they not stop Anguri Devi from approaching him? WHY DOES SHE THINK HE WOULD GIVE UP HIS EVIL SCHEMES FOR HER? Sweet Bindu on a biscuit, this woman is stupid, and that pisses me off. Consistently throughout the film to this point, she is clever, scheming, brazen, and courageous, but like countless molls before her she is undone by romantic love in the face of overwhelming evidence that not only does the man not love her but that he is the scum of the earth. Ajit is speaking; Satyawati dismisses him with a wave of her hand. Everything else in Detective Byomkesh Bakshy! is, to me, perfect. It earns that ! in its title. Between the work on this soundtrack of Sneha Khanwalkar and many other artists (though I assume she is largely responsible for bringing all this together, as well as for the background score?) and that of Amit Trivedi on Bombay Velvet, I feel like we're in a new golden era in which these brilliant artists are creatively soaring even more than usual within the stylistic demands of period films. (I don't include Anu Malik's work on Dum Laga Ke Haisha in this list simply because it's not as multi-influenced; I usually dislike his stuff but even I see that it's genius for its setting.) The lack of typical big-name Bollywood composers and singers gives Byomkesh and his world some thrilling edge, and it even adds to the suspense: even if you've heard the whole soundtrack before watching the film, you still don't know which song is coming when or how it will be used. Aspects of the songs also tie to the multicultural world of the city and time period this film inhabits—not the same cultures, of course (though some screaming Japanese metal or sampled/reconfigured traditional Chinese songs would have been pretty on point), but the music reminds us this is a setting in which people and their influences come, mix, and go. It is surely not a coincidence that a lyric about evil and faith ("I walk through the valley of the shadow of death") is in the language and religion imposed by of some of of Calcutta's invaders. Just as Byomkesh pings from clue to clue, the music does too. 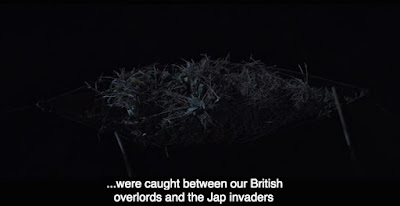 This concept is all over the background score, even pulling in the sounds of actions in the film, like a Chinatown dockyard drug deal accompanied by a murky, eerie combination evoking bianzhong reverberating underwater while a series of electronic bleeps punctuate above like wartime radar. I've read a few opinions referring to this film as lightweight and/or its story as silly. I can't agree with that; the, er, execution of the body count alone gives it some dramatic heft, as does the very setting of wartime world getting squeezed and desperate for conclusion. What I do think is true is what a friend on twitter said: the difference in her experience of this film and Bombay Vevlet is that this one does not take itself as seriously. It is completely serious and diligent in its world-building and narrative support and execution, but it is not particularly making complex or grand statements about human nature or trying to teach us anything. There's a lot going on but it remains crisp. It is far too careful a film to be lightweight. In the last few years, I've seen a lot of cinematic depictions of Calcutta, and this one cements itself into its locale without most of the standard elements. Again, I would expect that level of creativity from Dibakar Banerjee, but it really is rare (in my experience) to see a movie even mention Calcutta without jokes about fish, a shot of the Victoria Memorial, Kumartuli full of unpainted idols, references to puja, or a framed photo of Tagore. He does none of these things. He does include the Howrah Bridge (just barely opened at the time of this story) and the Indian Coffee House, but I assume the latter makes narrative sense, given Byomkesh and Ajit's phase of life. Ma Durga appears, right under the shadow of a blade drawn in anticipation of destroying a demon. My favorite sequence in the entire film is just a few seconds long but illustrates all of what I love about the movie. Byomkesh and Ajit have just encountered two sickening corpses and had to fish for clues amid all the blood and chaos of a crime scene, and as they stagger out into the street, the sirens blare and all the lights along the street are switched off and passers-by scatter for safety, leaving them in multiple meanings of isolation and darkness. Byomkesh, clearly rattled and revolted, stumbles to a water fountain and douses himself in a jittering time-elapse, as though trying to absolve everything his world has become. But within another minute, in his own home, he has to face down his enemy, making the water seem more like a baptism for what is to come rather than cleansing what has already happened. Believe it or not, I have even more to say about Detective Byomkesh Bakshy! than all of this, and Amrita and I are planning a podcast episode very soon. For friends in the US who haven't seen the film yet, it's available to rent and purchase on Google Play (I'm not sure if that's true for other countries). * As much as I love Dibakar Banerjee's films, when I think back on them most of the memorable characters are men, and I wonder why that is. Even Satyawati here is not very attention-grabbing, despite her interesting place in the film. Is he not willing to put in effort to write more women (sort of like how Satyajit Ray utterly failed to populate the otherwise magical world of Goopy Bagha with any females)? This project has the handy excuse of being a period film, but if you can choose to ignore the Bengal famine, you can certainly choose to let more women speak and participate in your story—or, since you're not sticking to the canon anyway, create a setting in which female voices are organic. I need to rewatch his other films to develop any kind of sound theory about this, but now that it's begun to nibble at me, I doubt I'll forget it. Your thoughts? ** [Spoiler!] I feel really bad for actors who play twist-related characters. It's so hard to talk about their performances without giving things away. There are several in this story, but Meiyang Chang is particularly good at smiling pleasantly through times his character really would rather be interrogating. What a terrific review! I loved this movie too. 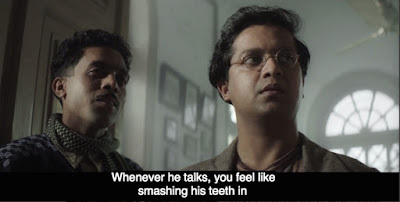 (Except for the awful Poirotesque scene you called on the carpet here--maybe Dibaker Banerjee's lamest screen moments ever....) I could spend an afternoon happily watching Byomkesh ride streetcars and drink tea, whether he solved any crimes or not. And I wish I had a quarter of your knowledge of Bengali film! Vah, vah! Oh yay, glad to find more people who like it! I really hope he gets to make the sequel that this one makes room for - like you, I could do with some more time with Byomkesh doing his thing. Excellent review. I think Anguri Devi symbolized her city Rangoon. She is beautiful and pretty, but she was used and abused, like the city of Rangoon that fell under Japanese control. In fact, at one point, she even makes a remark that Japanese took her beautiful city. 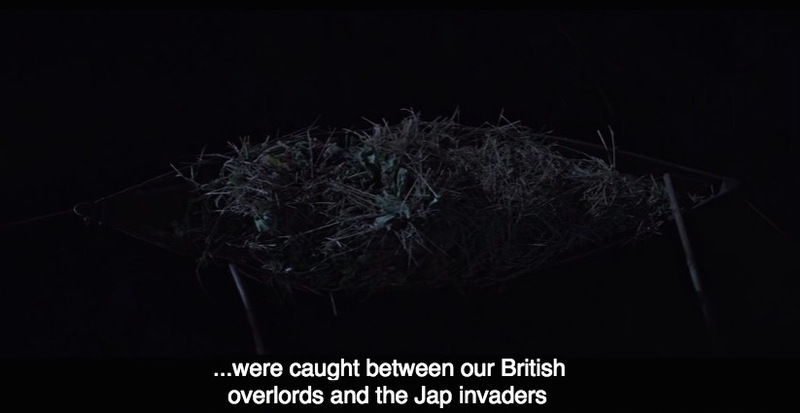 The fact that she dies was again referring to the capture of Rangoon by the Japanese forces. Were the other characters were a representation of their cities. For instance, was Satyawati a representation of the city of Calcutta? She is beautiful, cultured, headstrong, but not completely independent, like the city of Calcutta itself. And, the British Police Inspector Wilke always had a dog with him, was that some indication how Britishers treated India? Perhaps, that explains the scene where there is written History of Love on the board, and beneath that is written Sexual and Divine, and Feudalism and Oppression. The sexual and divine nature of Anguri Devi contrasts with feudalism and oppression of Rangoon. Pankaj - What wonderful points, especially about Anguri Devi! That hadn't occurred to me at all. That chalkboard is very intriguing indeed.